The smaller, charming 18th century cottage is listed as being of particular architectural interest by the “Architecte des Bâtiments de France” and care has been taken to restore it sympathetically. 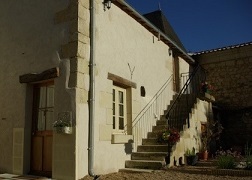 It has totally separate accommodation on the two floors: the downstairs gîte which is called La Maison d’Amis and the spacious upstairs suite which is called Le Grenier. 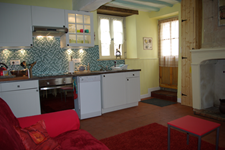 La Maison d’Amis is a cosy cottage which sleeps up to 2 people and has lots of character with its traditional beams and original tomette tiled floors. It has a small open plan kitchen and lounge/diner. The kitchen is fully fitted and well equipped including a ceramic hob, electric oven, fridge, microwave and dishwasher. The lounge area has a sofa and television, DVD/CD player and the dining area has a table and chairs to seat up to four people. Adjacent to the kitchen and lounge/diner are the double bedroom with its built in wardrobe and a separate shower room with wc, wash basin and shower. Outside, there is a patio with a table and chairs where you can enjoy al fresco dining.